For those of us who work in the podcast industry (and in Canada, that’s a small-but-growing number), this is not a new question. We speculate, we swap our favourite titles and anecdotes, we ask our friends and families, and we respond to iTunes podcast rankings like they’re tablets handed down from above. But the truth is that we’ve never really known the facts about our fellow citizens’ podcast listening habits. This week, Ulster Media and Audience Insights Inc. released a 57-page version of The Canadian Podcast Listener: A Landscape Study. 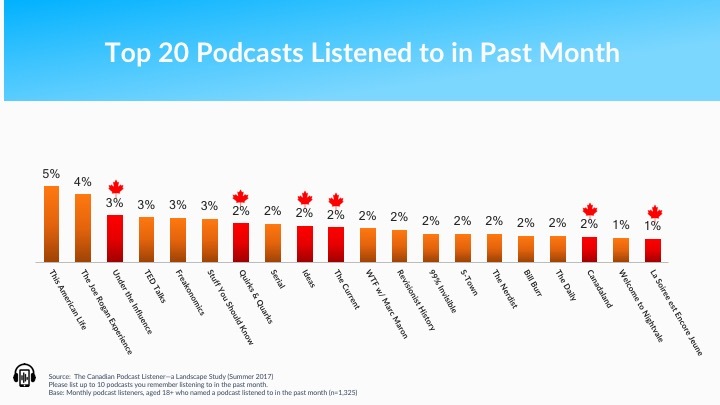 It offers a rare snapshot into the podcast listening preferences of more than 1,500 Canadians, giving us the first verifiable reporting of programs, genres and publishers that Canadians listened to in the summer of 2017. The report lists the Top 20 podcasts people say they heard the month before they filled out the survey. Putting that list together was no simple task. Participants were able to pick up to 10 different shows, which added up to more than 2,000 (!) different titles to sort through. Talk about a long tail - more than 80% of those titles were only mentioned by one person. This reinforces the double-edged sword of having lots of choices - with more than 400,000 podcasts available to check out, there’s something for everybody, but this creates lots of disparate, niche audiences who have very limited ways to share the podcasts they love. Despite the long tail, some podcasts definitely rose to the surface. Not in double-digit percentages, but there were some clear front runners. A few things jump out here. First, there are the usual suspects - podcasts from U.S. celebrities/brands that have been in the game for a while, like This American Life, Joe Rogan and TED Talks. No surprises there. But CBC is also prominent in the Top 10, with four entries. This interest in Canadian content bodes well for this country’s podcast makers, and is reinforced by the fact that many participants said they were interested in knowing more about what Canadian podcasts are available. While this is encouraging for domestic publishers, it is worth noting that CBC has had a massive head start, both in terms of establishing their brand and their experience producing quality audio programming. The fact that the CBC entries are all established radio shows doesn’t reflect the effort they’ve put into their original podcast initiatives. Part of the reason you don’t see some of their new, successful non-broadcast offerings (Someone Knows Something, Alone: A Love Story, Missing & Murdered, etc.) could be the timing of the study (summer), when they were not producing new material. It’s important to remember these are not download metrics, these are self-reported results, and people may only remember a few titles when asked. It’s also a reminder of how valuable it would be for the industry to have a single system all podcasters could sign on to for audience measurement purposes. Seeing Jesse Brown’s Canadaland on the list does offer some evidence that original (non-radio) Canadian content is in demand. A French-language podcast from Radio-Canada (La Soiree est Encore Jeune) also made the list, which is nice to see. In terms of publishers, CBC dominates. But NPR and This American Life (which includes Serial and S-Town) also figure very prominently on the list. Once you remove those top three giants, it's an interesting mix, composed mostly of original podcast networks that haven't really been in the game that long. WNYC is a great example of a "hybrid" model - a public broadcaster that's invested heavily in podcasts, which appears to be paying off. For a local media service to have built a podcast audience this size is impressive. There are many more insights and details in the report you’ll want to check out. I will be rolling out a new blog or two over the next few weeks, highlighting some other topics - including attitudes towards podcast advertising, and the differences between heavy and light listeners. I highly encourage you to dive in to the study and take a closer look, and please do let us know if you have questions.